Blockchain company Everus have recently revamped their Everus Wallet, introducing a host of new features which include the ability to store Bitcoin, Litecoin and Ethereum as well as the being able to exchange them for EVR inside the wallet itself. Along with this, Everus have also introduced their Everus Rewards feature that allows users to earn rewards points through referrals and use them on things like bill payments or crypto redemptions. Other upcoming features include a smart fully automated AI trading bot that will let just about anyone with an account make passive income out of crypto trading. Just a while back, we covered local blockchain company Everus in a feature piece in which they shared their vision of building a blockchain ecosystem and how they wanted cryptocurrency to be more than just a digital asset . Instead of just buying and selling, their aim was to turn crypto into something you could use every day. Aiming to hit that objective quickly, Everus introduced the Everus Multi-Crypto Wallet—an online crypto wallet that goes beyond just being able to trade crypto, and instead wants to make people use crypto as a proper currency for everyday things. 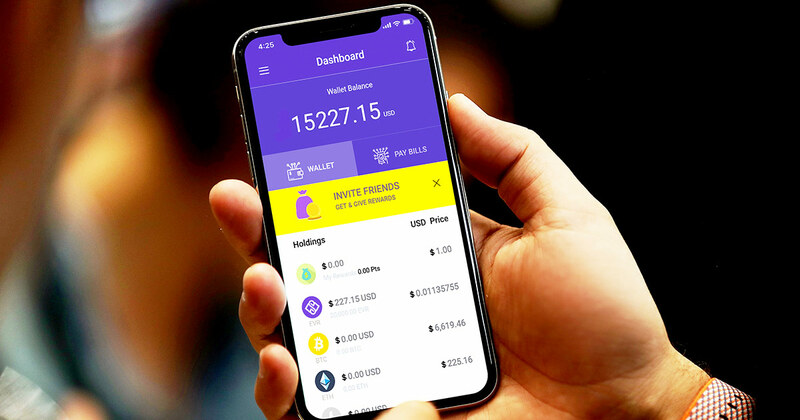 Much like how other mobile wallets work, the Everus Multi-Crypto Wallet holds a primary currency, in this case Everus’ very own Ethereum-based EVR token, and allows users to buy and sell said EVR token to be used for things such as bill payments, retail, and of course crypto trading among other things. But in times recent, Everus have updated their wallet to give their users more reason to use their platform, with key upgrades including a highly competitive rewards program and a way for them to generate income through crypto trading without them even having any basic knowledge of it. An updated and easier-to-navigate user interface. The ability to securely store multiple cryptocurrencies aside from their proprietary EVR token, including Bitcoin, Ethereum, and Litecoin. A feature that allows in-wallet coin and token exchanges, allowing users to directly exchange other cryptocurrencies into their main EVR token without leaving the wallet and with lower transaction fees. The ability for users to pay bills and mobile phone credit reloads. A new rewards program that allows users to earn points which can be redeemed in a variety of ways such as to pay mobile and utility bills all the way through to being exchanged for cryptocurrencies such as BTC, LTC, ETH and EVR. As mentioned previously one of the big features that Everus hopes to highlight on their improved wallet is the introduction of their Everus Rewards Points system—something they think will be key in driving users to their platform. The new rewards system operates first on a referral model that rewards users with Everus points for successfully getting their friends and family to sign up for an account of their own, and then reward them further as their referred signups continue to spend and transact on the platform. 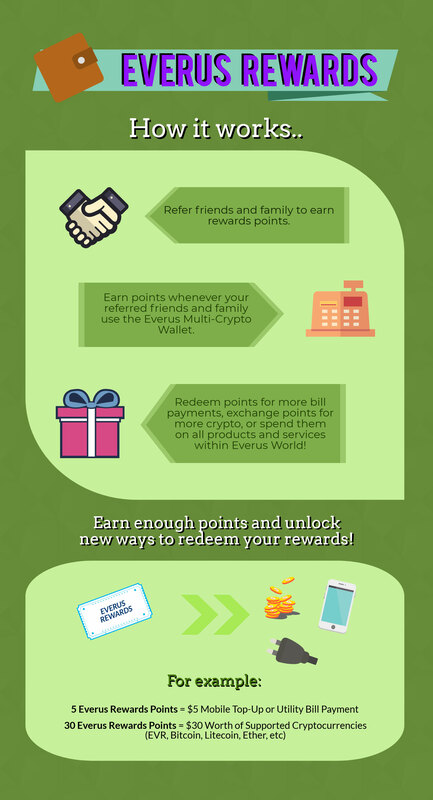 Upon earning these rewards points, users can then spend them on a number of things available in Everus World—their own ecosystem of services and partner merchants where EVR is the main currency used. For example, users could potentially use Everus Rewards Points to pay for their utility or mobile bills, or even better, exchange the points for more cryptocurrency, making it attractive for those looking to get into the world of cryptocurrencies but have yet to do so out of fear of risk and uncertainty. With the usability of the wallet now the key focus, Everus intend to keep adding more and more options on which users can spend their points, possibly to the point of their ecosystem containing everything one might need for everyday living. Another big feature that Everus is focused on is PSIGEN—their AI-driven trading bot with the capability to perform crypto trading on behalf of their users, essentially giving them a golden opportunity to create wealth on the side even without any elementary knowledge of how crypto trading works. Using preset algorithms and trade parameters, PSIGEN can work autonomously without the need for human supervision and practically lets the user trade crypto and turn a profit even while asleep, all while working in such a way that tokens are bought low and sold high at any given time. And to make it all even more attractive for the uninitiated, there are no contracts, subscriptions, or joining fees, with costs to use the PSIGEN service deducted from the profits made through trading. At the core of all this, the big idea that Everus wants people to grasp is that both cryptocurrencies and mobile wallets are the way forward, and it makes even more sense when combined into one service. Having already positioned their product as a cryptocurrency wallet for everyday use, Everus wants their service to be both functional and accessible, even to technological “noobs”. Looking ahead to the future of crypto wallets, it appears very much as if Everus have the way forward figured out—create an blockchain-driven ecosystem (Everus World) full of real-world appeal, and give the masses a comprehensive tool (the Everus Multi-Crypto Wallet) that they can use to access it. As for other development plans for their platform, the Everus team also revealed more upcoming improvements to the functionality of its platform, including introducing highly secure biometric-based safeguarding (fingerprint and facial recognition), and eventually expanding their exchange portion to recognise over 500 different cryptocurrencies from all over. Finally, they also plan to add on microfinance and global remittance features in the year 2019, making it even easier for users to exchange credit and make the wallet a truly global product. As of now, the backdrop of the digital payment race—in Malaysia at least—is still attempting to settle into a steady rhythm. Right now, there are still no clear market leaders locally despite some wallets being more favoured than others. But if current trends are any indicator, perhaps these companies could consider not only facilitating the transactions of regular currencies, but also crypto if they can afford it. Looking at the long game, Everus are pretty certain about their chances and think that usability is the key in making their platform succeed. For the time being, it still remains to be seen if what Everus are planning will work out a hundred percent, but at the very least, the idea is one worth keeping tabs on. To know more about Everus and what they do, visit their website or Facebook page. You can also download the Everus Wallet on iOS or Android.